For six months, Chad Thompson slept sitting up to ease debilitating headaches caused by a tumor growing on a nerve in his head. Now, after a successful surgery at Mayo Clinic’s Florida campus in March, the 40-year-old Jacksonville resident is having conversations with friends and co-workers that he never expected. The reason for this response is that he has no visible scars from the operation, which his surgeon, John Casler, M.D., performed with help from the Anatomage “virtual dissection” machine in the J. Wayne and Delores Barr Weaver Simulation Center. Purchased with philanthropic support from the Setzer family of Jacksonville, Florida, the Anatomage machine looks like a table-size touch screen, and it renders the human body and anatomy in three dimensions. It was originally created to reduce the need for cadavers in anatomy training for medical education, but it can also be used for surgical planning and case study review. Mayo Clinic has used it in patient care applications nearly 30 times and is one of the first medical centers to use it for that purpose, according to Conrad Dove, an information technology specialist in the simulation center. Chad's case may be the most extensive example to date of the Anatomage’s application for patient care, says Dove. With help from Dove and the machine’s technology, Dr. Casler, chair of Otorhinolaryngology at Mayo Clinic's Florida campus, found a better way to remove a 5-centimeter schwannoma, a benign nerve-sheath tumor, from Chad's head. 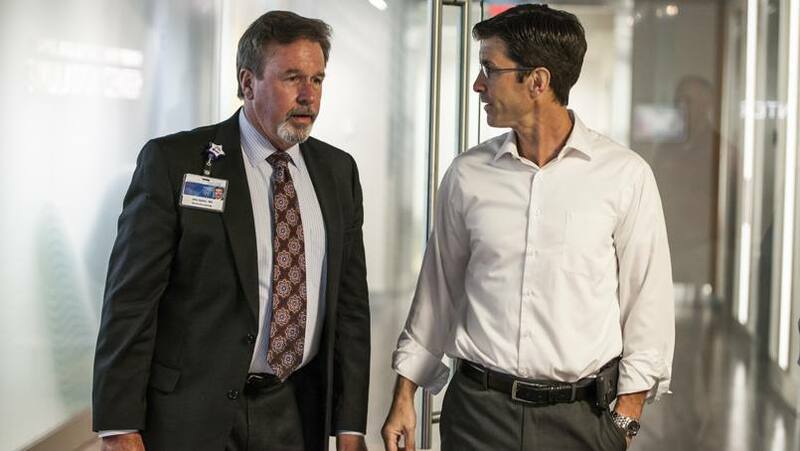 “We left the meeting feeling confident we could do it and feeling like we had done everything we could to stack the odds in Chad’s favor.” - John Casler, M.D. Dr. Casler and Chad wrestled with that concern for several weeks. Chad researched anatomy and surgical techniques and sought a second opinion at another medical center, but he didn’t find another alternative. So he talked to his family and friends to prepare them for the potential outcome of his surgery. Then, about two weeks before the surgery, Dr. Casler thought of a different approach, one that would use an incision underneath Chad's upper lip and through the bone of his mid-facial skeleton to access the tumor. It would cause no scarring to Chad's face, but Dr. Casler needed to find out if the idea was feasible. 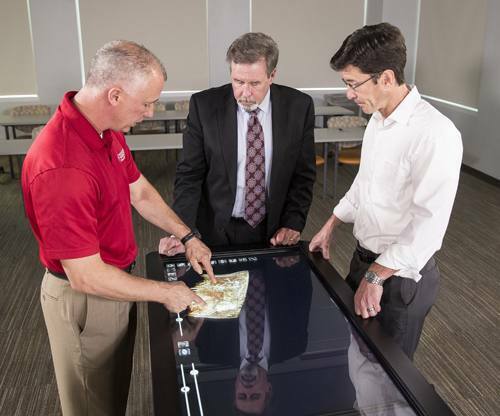 Conrad Dove (left) and John Casler, M.D., (center) discuss the surgical approach with Chad Thompson using 3-D modeling. Enter Dove and the Anatomage. With a special MRI of Chad's head and neck, Dr. Casler and his team met with Dove in the simulation center and looked at – and manipulated – the 3-D images the Anatomage created from Thompson’s MRI. Within 45 minutes, they pinpointed the tumor’s location, identified troublesome blood vessels they would have to avoid, and developed a “mental map,” Dr. Casler says, for the alternative surgical technique. “We left the meeting feeling confident we could do it and feeling like we had done everything we could to stack the odds in Chad’s favor,” Dr. Casler says. He called Chad and told him the surgery could be performed a different way. Later that day, his wife arrived at the hospital and was “tickled pink,” Chad says. The results were so good they decided it was safe to show the children. Instead of being alone at the hospital on Easter Sunday, Chad was surrounded by his family. He left the hospital the next day and within a week looked just as he does now. A triathlete, he’s swimming and cycling and will resume running in a few more weeks. Note: Thompson, Dove and Dr. Casler got together five weeks after the surgery for a special live video broadcast on Mayo Clinic’s Facebook page demonstrating the Anatomoge table and reviewing Chad’s case. Watch the broadcast, which has been viewed more than 160K times, and share it with your friends. Explore the Department of Otorhinolaryngology. Connect with other patients talking about schwannomatosis on Mayo Clinic Connect. See the Anatomage machine in action.